Ford Times motoring magazine from 1963. Homepage. This page: A review of the Dagenham manufacturer's Ford Times car magazine of the early '60s. Magazines from other car manufacturers, such as BMC and Standard-Triumph, have already been reviewed in this section, and now it's the turn of Ford's factory-produced magazine, titled Ford Times. The magazine can traces its roots to the early days of Ford motor-car manufacture, and somewhere around here I've a copy from the 1920s that I'll pop on here sometime. This though is one of a pile of Ford Times magazines that I have dating to the early 1960s, September/October 1963 to be precise. 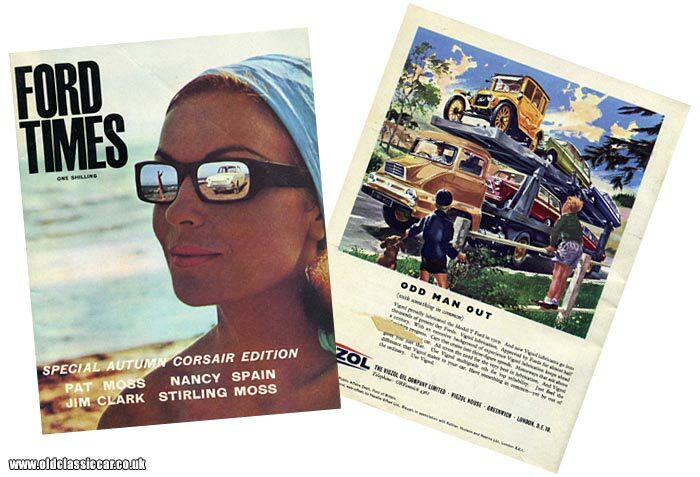 The cover illustration features a chirpy young lady, very '60s cool and chic, with the glorious image of a Ford Corsair reflecting in the nearside lens of her sunglasses. A tall bloke saluting the ocean can be seen reflected to the offside. The rear cover contains a full-page advertisement for Vigzol motor oils, illustrated with a Ford Thames Trader car transporter fully loaded with contemporary Ford Cortina estates, with a lone Model T raising the tone, in pole position over the driver's head. This particular magazine found itself in the hands of Bryan Bros Ltd, main Ford dealers at College Green in Bristol. Fifteen pages of advertisements have to be negotiated before the content proper begins, firms wishing to associate themselves with the blue oval by way of advertising include Esso, Cleveland Discol, Witter tow bars, Firestone (suppliers of OE tyres on the Corsair), and Martin Walter Ltd with their Dormobile conversions for the Ford 400E. Sound Stories EPs and LPs. Much of the content within this issue of Ford Times revolves around the soon-to-be-launched Corsair, set to make its public debut at the Motor Show in October 1963. The first article though takes a look at the life and times of one Stanley Schofield. Collectors of motoring LPs and singles may well recognise the name, as he was the top man of SS Sound Stories, the firm that marketed a host of car-related records in the 1960s, many with a motor racing flavour to them (see the motoring records page for example of Sound Stories 45s). Fifteen EPs and Six LPs were on offer in 1963, enabling the armchair enthusiast to fill their ears with the joyous sound of pre-war Mercedes Grand Prix cars, and the deafening post-war V16 BRM to name just two. Your neighbours, wife and pet(s) were probably less-than-impressed with the racket emanating from your Dansette gramophone player, as a result of buying a Sound Stories product, but it must have been preferable to offerings from Cilla and the like. Stirling Moss' ideal family car. Pages 20 and 21 see the editor visiting the home of Stirling Moss, former racing driver now getting used to a life away from active competition following his horrific crash at Goodwood in 1962. He was interviewed by Ford Times for his thoughts on modern car design, and how he would go about modifying a typical family saloon for his own tastes. For starters he'd want it to be capable of 100mph with some minor tuning, it should be capable of 30mpg and have a range not less than 300 miles per tank. Electric windows, air conditioning, and a remote control for the garage door would also be on his "essentials" list. He didn't have much faith in the security of having an ignition key to stop ne'er-do-wells from stealing one's motor, his own car was equipped with a dial combination, on which you rotated the letters to a pre-set code, then hit a starter button to churn the engine into life. Smokers would be interested in his suggestion of a vacuum ashtray, while ICE fans would agree with his idea of having a tape player incorporated into the driver's seat armrest, pre-loaded with tape containing one's favourite tunes. There would also be a voice recorder included within it, allowing the driver to dictate letters while at the wheel. His preferences also extended to a built-in Kleenex dispenser, electrically-operated radio aerial, two-speed wipers, and a windscreen incorporating a graduated tint. Later in the magazine there is a column penned by Stirling's sister Pat, where she discusses general matters regarding her life (eg a new house purchase, with husband Eric Carlsson), along with a few comments regarding rallying, their Cortina Lotus road car, and her thoughts about the then-Minister of Transport, Mr Ernest Marples. Three pages are given over to the interesting life enjoyed by a Mr John Crewsdon, daring aviator to the film industry. At the time of writing he was involved with filming for 633 Squadron, and was interviewed for the magazine while at the controls of a DH Mosquito. Aircraft in his own fleet included a Mosquito, two Spitfires and a couple of light aircraft, while his earth-bound vehicles were Dagenham-sourced machines, namely a Ford 7cwt van, a 15cwt Prime Mover, a 12 seat Minibus, two Cortinas and a Capri. He regularly had to source aircraft to then fly for the film makers. On one such job, working on The War Lover, he was tasked with finding some airworthy Boeing B17s. Eventually he sourced some stored out in the Arizona desert, encouraged them into airworthy(ish) status along with his Chief Engineer Leslie Hillman, and brought them back to the UK. He had to divert into Lisbon during the ferry flight due to an engine catching fire, but made it back home eventually. 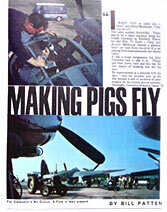 The day after the interview, one of the riskiest shoots for the 633 Squadron film took place, whereby John intentionally "crashed" a Mosquito for the movie. Fire-retardant foam was sprayed into all but one of the aircraft's fuel tanks, the remaining tank receiving five gallons of aviation fuel. The plan was to accelerate along the runway to 90 knots or thereabouts, and raise the undercarriage, all with the cameras rolling naturally. Anyone who has watched the film will have seen the crash, happily the daredevil pilot escaped unharmed and continued with his flying career. 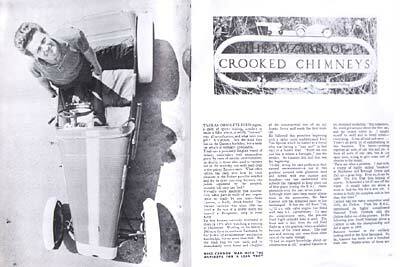 Mike Cannon was the gent behind the Cannon trials car, and an article in Ford Times takes a closer look at his operation, run from a building at his farm, Crooked Chimneys. He built his first, personal, trials car by chopping up an Austin 7, followed then with a Ford Ten Special, which set him off producing trials cars for other people, a friend having trialled Mike's own Ford and came away impressed enough to request a duplicate car for himself. Modifications made to the engine were pretty routine for the average Ford Special guru of the 1950s, fit twin SU carbs to the 1172cc engine, and the head from a pre-war 8hp Ford to raise the compression. Finding suitable parts could at times be a problem, as many parts were bought at breakers yards then modified to suit the trials car. He says that things became a little easier at the introduction of the Ten Year Test, as many tired old clunkers found their way into the yards and provided a useful increase in suitable bits and pieces. Big news for Ford fans though was the upcoming launch of the new Ford Corsair (period photos can be seen on the Corsair page within the gallery section), a two- or four-door saloon selling at the same price as its pre-decessor, the Consul Classic. Prices started at £653 1s 3d for the base two-door version. Standard and De Luxe specifications were offered for the normal two- and four-door cars, while motorists with a penchant for string-backed gloves and traffic light Grand Prix, would probably have preferred the sporting GT version. Extra poke and equipment (eg a heater) didn't come cheap though, as the GT buyer would need to fork out £816 3s 9d for their preferred model. An estate would also be listed, while anyone yearning for wind-in-the-hair Corsair motoring could splash out later for their own Crayford convertible version. Plus points for the new "Cool, Keen Corsair" included sealed-for-life suspension joints, replacing the traditional type that needed a grease gun taking to them every 1,000 miles or so. Extensive sound-deadening material, and the careful use of double-skinned steelwork, would give "... cathedral standards of 'hush' ..." apparently, while disc brakes were standard fitment. However we didn't just get the marketing assistant's spin on the new model, for Lotus-Ford Grand Prix driver Jim Clark also provided his own impressions of the new Corsair (code name Buccaneer). He likened the front-end styling to that of the Ford Thunderbird, and was clearly impressed by the 21 cubic ft of boot space and comfy driving position. The doors "close like a dream", while the 1500cc motor "has a remarkably powerful punch even at low rpm". He tested the car at the Chobham proving ground, and came away enthusing about the Ford's handling characteristics. Of the GT he was particularly gracious, complimenting the bucket seats, and the extra performance made available by the fitment of a high-lift camshaft, four-branch exhaust manifold, remote gearshift, twin-choke carb, and servo-assisted brakes. Several more pages then describe the Corsair range in more detail. A number of general-interest articles feature within the pages of this magazine, and aren't that fascinating if I'm honest. One eye-catching piece introduces the reader to a young lady by the name of Jennifer Nadin, who became Pat Moss' co-driver in the BMC works cars. Her father had been a Bugatti racer prior to the war, and through his contacts Jennifer met up with Marcus Chamber, who at one time was the competitions manager for the BMC Works' rally team. Pat and Jennifer met, at a time when the former was looking for a new co-driver, which led to them piloting a Cortina GT in the Tulip Rally. The final pages are given over to advertisements, with most casting a light on Ford's heavyweight range of commercial vehicles. J. Brockhouse & Co. Ltd. invited readers to find out more about their fifth-wheel conversions for Thames Traders, while the British Trailer Co. Ltd. could supply the haulage expert with a splendid four-in-line semi-trailer to attach to the back of their lorry. An advertisement for Filtrate Oils is illustrated with a Trader towing a sleek tanker body, signwritten with the company's livery.